India's northeastern border with Tibet, being a natural geographical border formed along series of snow clad Himalayan peaks, can be crossed only through few natural mountain passes on the mountain ridges or by walking along the foot ways formed on the narrow banks in the basins of three or four torrential rivers, that cross this natural border. Because of this natural protection and also considering the fact, that there was absolutely no border dispute of any kind till 1959, between India and Tibet, British India Government had never taken any military steps to safe guard this border. Few border posts near the mountain passes and the river beds were established by British India Government to secure these places. This policy was continued by Independent India under premiership of Nehru. Since there were no roads in this region, most of these frontier posts in the NEFA region were maintained by airdrops of all essential provisions to Assam Rifles policemen, guarding these border posts till 1959. In August 1959, in a surprise move, Chinese attacked Indian position at Longju in Subanseri sector. About 200 to 300 Chinese soldiers attacked few Assam Rifles Policemen guarding this post. There was a small number of policemen guarding this post and they defended this post for 2 days gallantly. After that, they had to withdraw in the interior. This had happened even prior to Kongka Pass incident, described by me earlier, that took place in east Ladakh, during October 1959. In November 1959, Chinese unilaterally declared that they no longer accept McMahon line as the agreed boundary between India and Tibet. It can be said that attack on Longju post was in a way a precursor for the things to come. As a response to new Chinese postures, Indian Government had decided in 1959 itself, to increase number of army posts on the NEFA border,. It was also decided by the Government in Delhi to construct more foot ways, bridges and mule tracks along the border so that supplies can be reached to new military posts on the border in a faster time frame. However it took very long for the Government machinery to actually implement the policy decisions and construction began only in summer of 1962 though 34 new border posts were already set up nearer to McMahon line. Even though new posts were established, no bridges, roads or mule tracks were ready till summer of 1962, which would have ensured that the supplies reach the posts in a quicker time span. Because of this reason, supplies were made to these forward posts by para dropping with help from Indian air force. A Chinese report mentions that most of the supplies never reached the men because of the extremely hilly region. Since the posts were not connected to each other by tracks or roads, they remained essentially isolated and were unable to provide cover to each other as is normally planned when setting up such posts. All these deficiencies were pointed out by the local commanders to Army HQ and then to concerned Government ministers. Unfortunately, these complaints fell on deaf ears as both prime minister Nehru and defense minister Krishna Menon were of the firm opinion that China would only continue with minor incursions and never would launch a full scale conflict. The advanced border posts now set up would be able to effectively handle and control any such Chinese incursions in future. 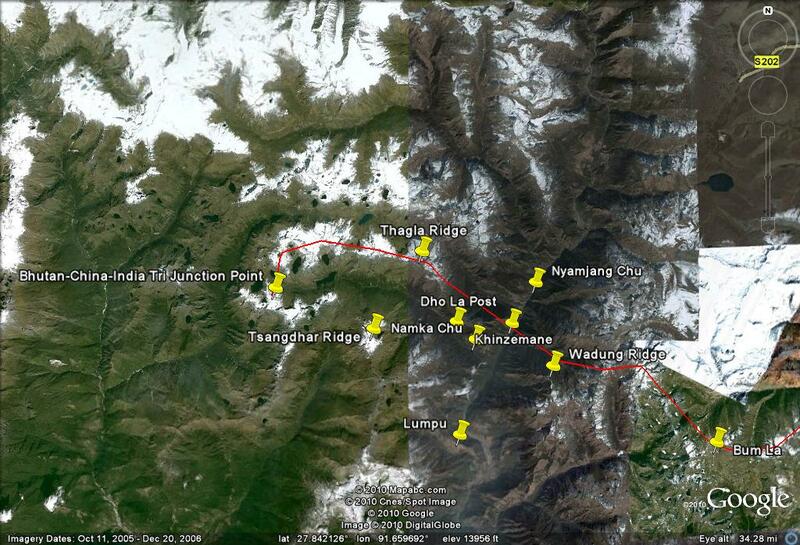 I have mentioned earlier that the McMahon line follows the Himalayan peaks all along the border. However, near the Tri-junction point of the borders of Bhutan, India and Tibet, there was a minor border dispute between India and China. A small river, which swells only during monsoons, flows from this Tri-junction point to east, between two mountain ridges known as Tsangdhar Ridge in the south of river and Thagla Ridge in the north of the river, till it confluences with Nyamjang Chu river. (Another small river). According to India's position, McMahon line passes along Thagla ridge from the Tri-junction point, to Nyamjang Chu river and then continues along Wadung ridge to Bum La, whereas Chinese maintained that the border passed along Tsangdhar Ridge to Nyamjang Chu river. The Namka Chu river valley is extremely narrow and large scale troupe movements are almost impossible here. Out of the new posts set up in NEFA in 1959, one army post known as Dhola post, was set up on the southern bank of this Namka Chu river. Another post on the bank of Nyamjang Chu river further to north was also then set up at Khinzemane. Chinese soldiers had attacked this post in 1959 and had pushed Indians back from this post. Indians had reoccupied this post after Chinese had gone back and were holding it till 1962 Autumn. 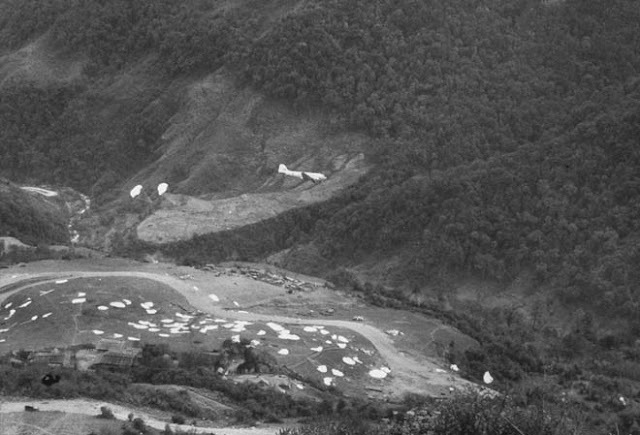 In Agust-September 1962, Chinese army brought in their men in large numbers to the Thagla ridge area. 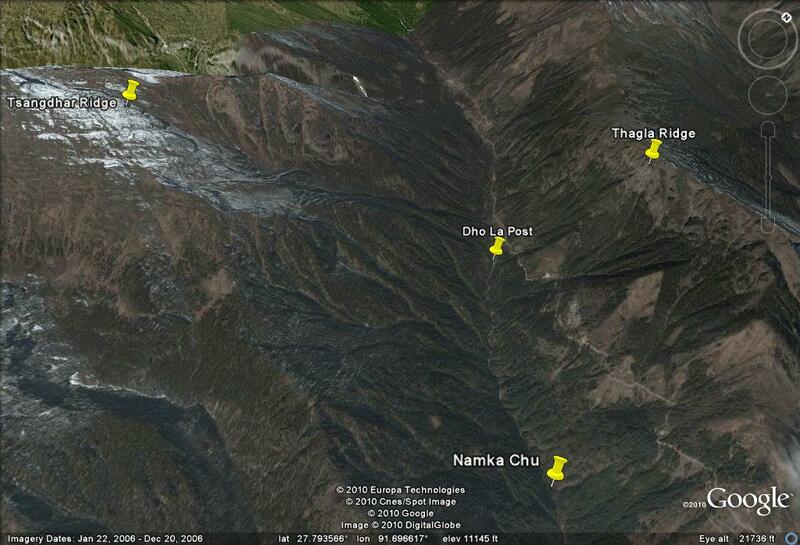 Army sources reported to Delhi that about 400 Chinese were now positioned on Thagla ridge. Presence of Chinese in such large numbers was a direct threat to posts at Dhola and Khinzemane. After this news reached Delhi, Defense minister Krishna Menon suggested to Chief of Army staff, General Thapar that the Chinese on Thagla ridge should be immediately evicted from there. Knowing the ground realities well, General Thapar tried to argue with the defense minister about futility of any such major action in that narrow area. He was however told that considering the political pressure on Prime minister Nehru, this order has to be obeyed by the army. Till September end, there were only incidences of minor skirmishes in Namka Chu valley with overall military situation fairly stable. However large number of Indian troupes descended in this area on orders from Delhi in next few days. This large scale arrival of Indian troupes in this narrow valley was hallmarked with total disarray, disorder, confusion and mismanagement not usually associated with a military movement on this scale. The soldiers did not have enough warm clothing, ordnance was in short supply. Troupes provided with mortar launchers had no mortars to launch. There was paucity of guns and being such a narrow valley and that to on the international border, para dropping was not feasible. After realizing the desperate situation of these new arrivals, the officer in charge of the operation, Maj.Gen Umrao Singh, bitterly complained to his seniors in Delhi. This resulted into a decision, which had direct bearings on the final outcome of the conflict. Maj.Gen Umarao Singh was abruptly transferred and in his place a comparatively inexperienced officer, Maj. Gen. B.M. Kaul was brought in as officer in command. In an most surprising decision Ma.Gen. Kaul was ordered to liaison directly with Prime minister Nehru and not through normal official channel of Army HQ or chief of army staff. It can be said that Chief of Army staff, General Thapar disassociated himself with the Namka Chu operation completely. In next fortnight, approximately 2500 Indian soldiers arrived in Namka Chu valley. The strategic battle plan prepared by Maj. Gen. B.M. Kaul has been discussed in many forums over the years, including some on the internet and there is unanimity of opinion that in the history, very rarely one may find, anything as disastrous as this.An excellent account of the battle can be read on this link. The Chinese saw arrival of such large numbers of Indian soldiers in Namka Chu valley as a big danger sign and Chinese soldiers also started arriving in very large numbers. 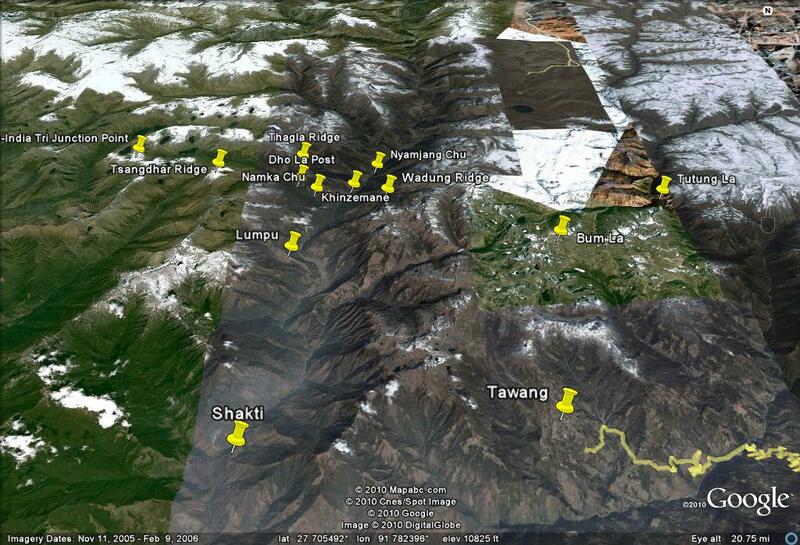 By 20th October 1962, as many as 30000 Chinese soldiers arrived on Thagla ridge area. Only after their arrival, Maj. Gen. B.M.Kaul came to realization that he had brought such large numbers of his own soldiers in a death trap. However it was too late now. 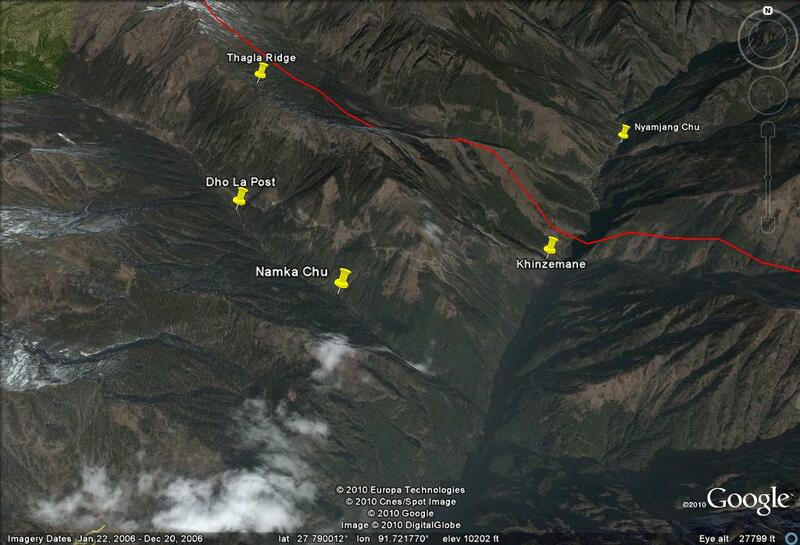 On 21st October 1962 Chinese crossed Namka Chu river and captured all Indian positions on the south bank of the river. On 23rd October 1962, Government in Beijing allowed PLA to cross McMahon line as and when required. Indian army soon realized that it was impossible to launch any counter offensives because enemy had all the advantages and they started retreating. Within next 5 days of massacre and debacle, India army was pushed back 10 miles to south of McMahon line to Lumpo. Indian army units lost large numbers of soldiers in this close battle. Second Rajput lost 282 men out of 513 deployed. Gurakhas lost 80 men and 90 were captured. 493 soldiers of Seventh Brigade were killed in this battle. It is to the credit of the Indian soldiers that they fought with much bravery and gallantry under adverse conditions in which they were pushed. Chinese too, lost a huge number of men in this battle. Indian men, who had fought at Namka Chu received as many as 15 top gallantry awards later. From the number of these awards, it is possible to imagine the high moral and bravery of Indian soldiers with which they had fought this battle. A memorial for Namka Chu battle was later erected near Lumpo. 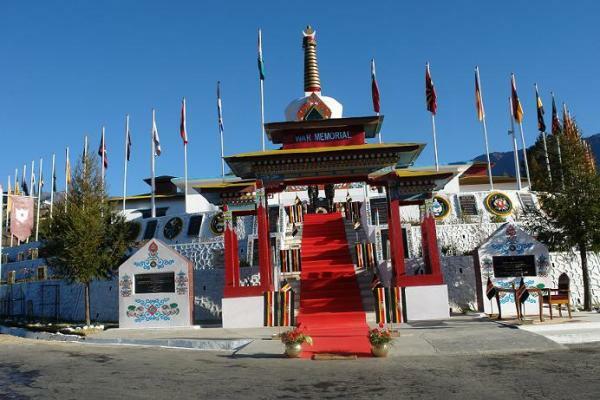 However because of extreme weather conditions, it got damaged and finally a 40 feet tall proper and befitting war memorial was erected in the town of Tawang in 1999. A writer, Neville Maxwell writes in his book 'India’s China War' that if General Thapar would have resigned when ordered to evict Chinese from Thagla ridge, probably 1962 war might not have happened at all. I do not agree with this, because the basic aim of Chinese in 1962 war was to secure the Aksaichin road in Ladakh and they would have gone to any length and would have started this war later, if not at that point of time. 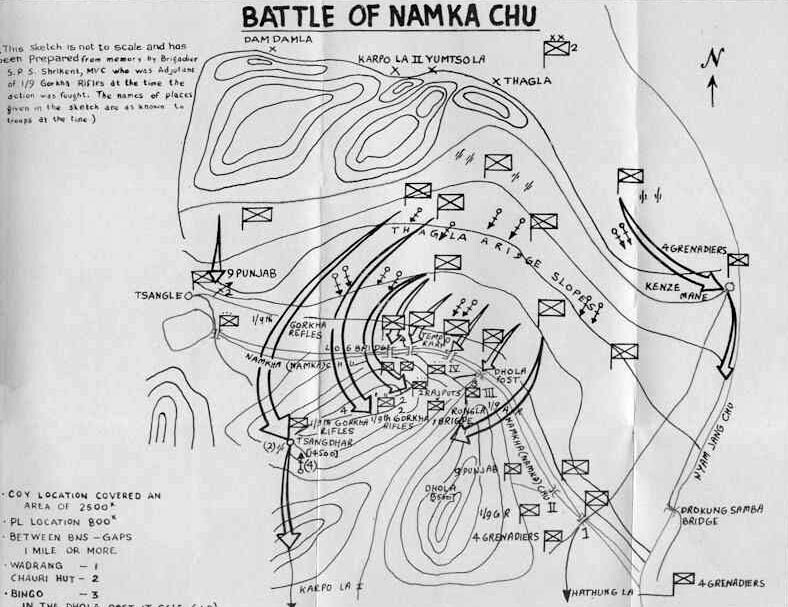 The defeat of Indian army in the battle of Namka Chu is considered as an extremely important event for any historical Military strategy study. The total failure of the Generals to take decisions after considering ground realities, mismanagement, WW II vintage arms, lack of warm clothing, unacclimatized troupes and extremely immature political leadership, are some of the reasons that brought in such a big defeat with loss of hundreds of brave soldiers and officers. Regretfully, I have to say that the gates of NEFA were opened to China because of this unnecessary war on a totally wrong kind of battlefield. The battle strategy plan envisaged by Maj. Gen. B.M.Kaul for Namka Chu, had no provision of a defensive front at the rear of the McMahon line, in case the front line soldiers were defeated due to some reason and had to fall back. Perhaps in the undue haste with which soldiers were sent to Namka Chu, this fact was never thought or planned and no reserve force was kept at the rear. With all positions of the army near Thagla ridge now overtaken by Chinese, and Indian army retreating and running away from the battle zone, there were no forces left for protection of Tawang town any more.